Introducing a new concept in showering from Ultra Finishing - The Pioneer thermostatic shower valve is injection moulded from a high grade engineering polymer. This Concealed Thermostatic Valve will compliment any modern bathroom suite, offers thermostatic showering via two easy-to-operate controls for temperature and flow. 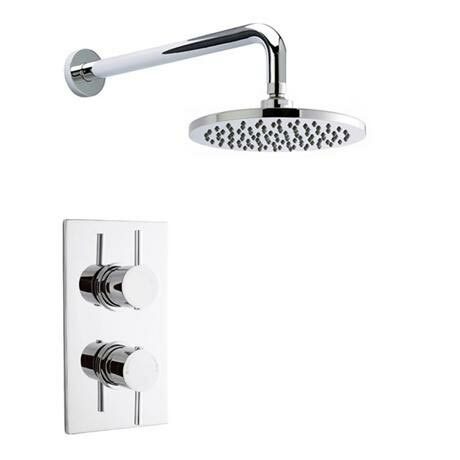 Supplied with a 200mm round fixed shower head with swivel joint and arm. A first in the market, this state of the art patented design shower valve draws on technology commonly used in the defense and aerospace industries - to produce a super-strong, lightweight valve. Pioneer is highly resistant to calcium build up, can withstand pressures of up to 25 bar and is temperature resistant up to 85 degrees. Partnered with the proven patented technology of the valquest thermostatic cartridge - Pioneer offers the best in shower valve design - at an incredible price. The pioneer valve is 100% recyclable and manufactured in the UK, reducing its environmental footprint. Supplied with swivel joint and wall mounted round arm. Please note - Shower head chrome plated plastic, not metal. Q. Can you please confirm the depth of the shower valve going back into the wall.? Is it adjustable if so what are the maximum and minimum depths? Hi, this is adjustable, it can be 75-95mm deep in the wall, so 75mm is needed as a minimum. Thank you. Q. How deep into the wall does this valve go? it is adjustable between 75-95mm so the space you need would be a minimum of 75mm. Thanks for your question, I hope this helps! Q. can I also connect the handheld shower to this valve while still keeping the overhead showe working? Shower arrived quickly and was as described, no problem with the quality and the instructions clear. I am so pleased with my purchase. The shower looks fantastic and delivery was super speedy. Great customer service.